Property Details: 4 Bedroom, 4 Bathroom waterfront condo with approx. 2,500+/- s. f.
Pernsacola Florida condo for sale at Harbour Pointe . Amazing waterfront condo overlooking the marina, intra-coastal waterway, and the amazing Gulf of Mexico! This luxurious penthouse residence has it all! Walk into this beautiful 2,500 sq. ft. condo that is complete with travertine tile flooring with carpet in the bedrooms, Arched hallways, granite counter tops, living-room & dining room with gulf views, flat screen T.V.’s, the master bathroom has a tiled tub with a stand up glass shower, beautiful tiled bathrooms throughout, crown molding, tray ceilings, and much, MUCH more! 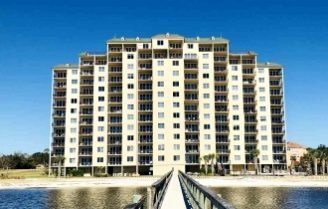 This condo is true paradise…a stone’s throw from the sugar-white beaches of Perdido Key! Outdoor Pool · Hot Tub · WiFi · Private Balconies ·Pier.